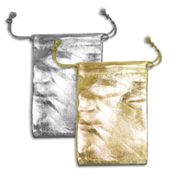 Discover our collection of nylon drawstring pouches in metallic colors! These gold & silver pieces are great for gift packaging and retail jewelry sales. Available in many sizes, for rings, earrings, pendants, necklaces chains & more. Get the best deals thanks to our wholesale discounts!